Wind turbines in the Bonneville Power Administration’s transmission grid generated over 4,000 megawatts for the first time on Sunday, March 11, producing nearly twice as much energy as that generated by coal, gas and nuclear plants connected to BPA’s system at that time. Wind generation on BPA’s system surpassed the 4,000 megawatt milestone at 3:22 p.m., reaching a new all-time peak of 4,039 megawatts about an hour and a half later. BPA expects to have 5,000 megawatts of this clean, emission-free, renewable resource connected to its system by 2013, several years ahead of earlier estimates. 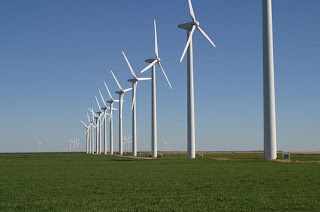 The grid operator for most of Texas broke its wind power generation record twice this week. But what's almost as notable is what was behind the record—besides the wind, that is. Wind output reached 7,599 MW at 8:41 p.m., last Wednesday, exceeding the 7,403 MW record from the previous day by 196 MW and meeting a full 22 percent of the system’s electricity demand. At the time of Wednesday’s record, total system load was 34,318 MW. Prior to March 6, the record for wind output in ERCOT was 7,400 MW, recorded on Oct. 7, 2011. 7,599 MW is enough to fully supply about 6 million typical American homes at average usage levels. Especially noteworthy about Texas is how elements of the still-elusive smart grid, using a "new transmission analysis tool", made the production both possible and usable, by intelligently setting generation ceilings and moving the power from West Texas to population centers with unmet load. Despite the fossil messaging, renewable energy is our future. Wind and other renewables are leading the economic recovery; isn't it time our political leaders got this straight?